At PhysicsOpenLab we use many scintillation crystals, mainly coupled with PMTs or SiPMS, to detect particles or radiation. 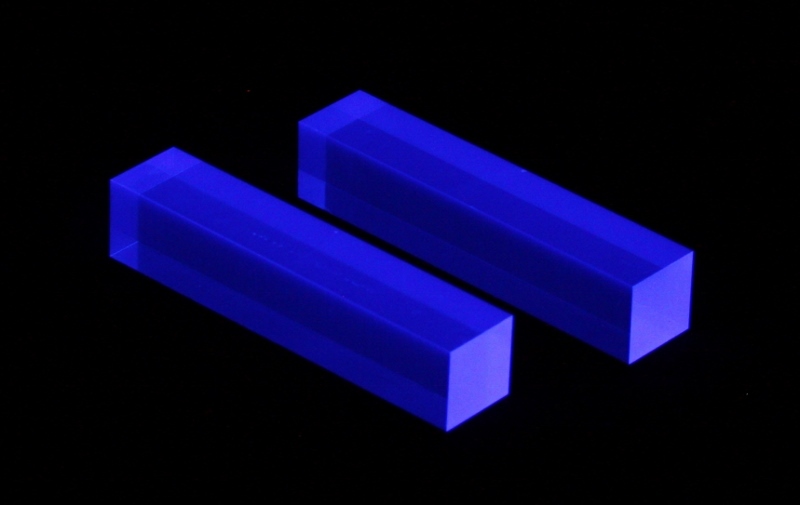 In this post we want to describe the scintillation crystals we normally use in our detectors. A scintillator is a material that exhibits scintillation (the property of luminescence), when excited by ionizing radiation. Luminescent materials, when struck by an incoming particle, absorb its energy and scintillate, (i.e. re-emit the absorbed energy in the form of light). Sometimes, the excited state is metastable, so the relaxation back down from the excited state to lower states is delayed (necessitating anywhere from a few nanoseconds to hours depending on the material): the process then corresponds to either one of two phenomena, depending on the type of transition and hence the wavelength of the emitted optical photon: delayed fluorescence or phosphorescence, also called after-glow. A scintillation detector or scintillation counter is obtained when a scintillator is coupled to an electronic light sensor such as a photomultiplier tube (PMT), photodiode, or silicon photomultiplier (SiPM). PMTs absorb the light emitted by the scintillator and re-emit it in the form of electrons via the photoelectric effect. The subsequent multiplication of those electrons (sometimes called photo-electrons) results in an electrical pulse which can then be analyzed and yield meaningful information about the particle that originally struck the scintillator. Light output (LO) is the coefficient of conversion of ionizing radiation into light energy. 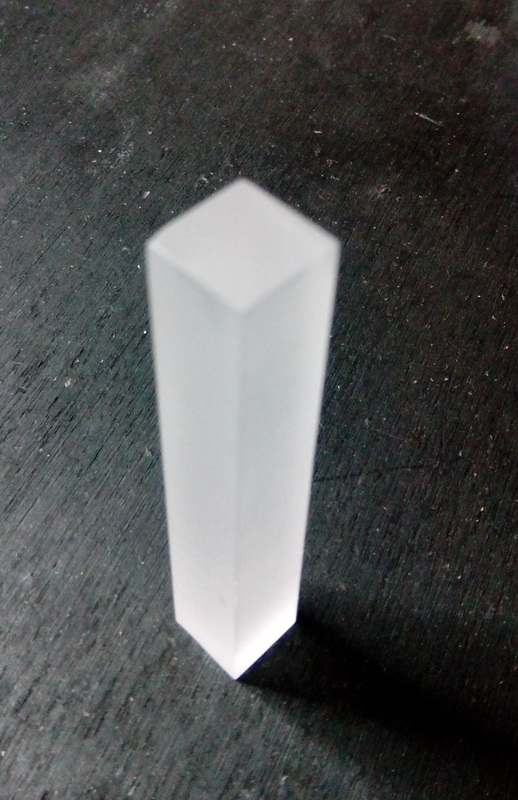 Having the highest LO, NaI(Tl) crystal is the most popular scintillation material. Therefore, LO of NaI(Tl) is taken to be 100%. Light output of other scintillators is determined relative to that of NaI(Tl) (%). LO (Photon/MeV) is the number of visible photons produced in the bulk of scintillator under gamma radiation. Scintillation Decay time is the time required for scintillation emission to decrease to e-1 of its maximum. Energy resolution is the full width of distribution, measured at half of its maximum (FWHM), divided by the number of peak channel, and multiplied by 100. Usually Energy resolution is determined by using a 137Cs source. Energy resolution shows the ability of a detector to distinguish gamma-sources with slightly different energies, which is of great importance for gamma-spectroscopy. Emission spectrum is the relative number of photons emitted by scintillator as a function of wavelength. The intensity maximum is indicated by the Imax wavelength. For efficient detection of emitted photons, the maximum of PMT quantum efficiency should coincide with Imax. Background is a quantity determined as a number of luminescent pulses emitted by radioactive substance within 1 second in the bulk of the scintillator with the weight of 1 kg. Most scintillation crystals reveal a number of luminescent components. The main component corresponds to Decay time, however less intense and slower ones also exist. Commonly, the strength of these components is estimated by using the intensity of a scintillator’s glow, measured at specified time after the Decay time. Afterglow is the ratio of the intensity measured at this specified time (usually, after 6 ms) to the intensity of the main component measured at Decay time. 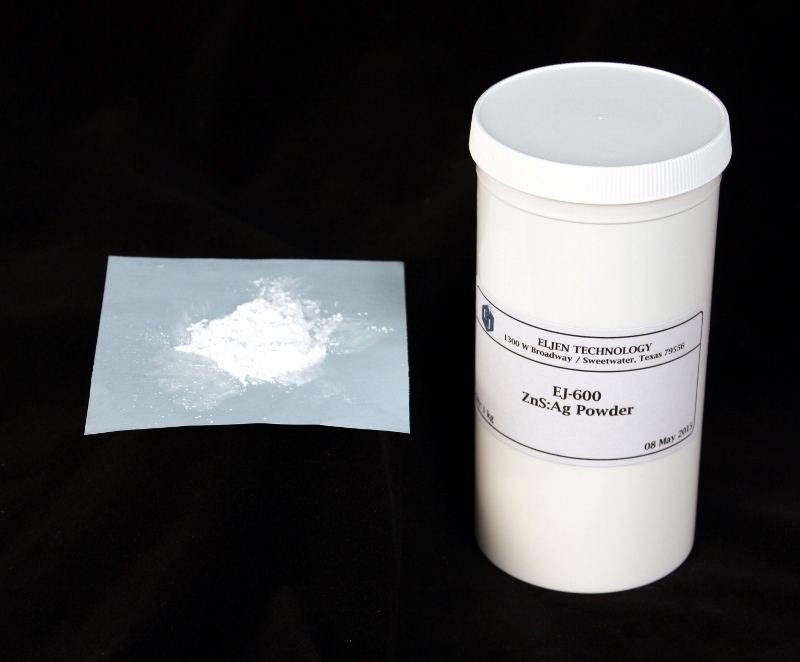 Thallium doped Sodium Iodide NaI(Tl) is the most widely used scintillation material. 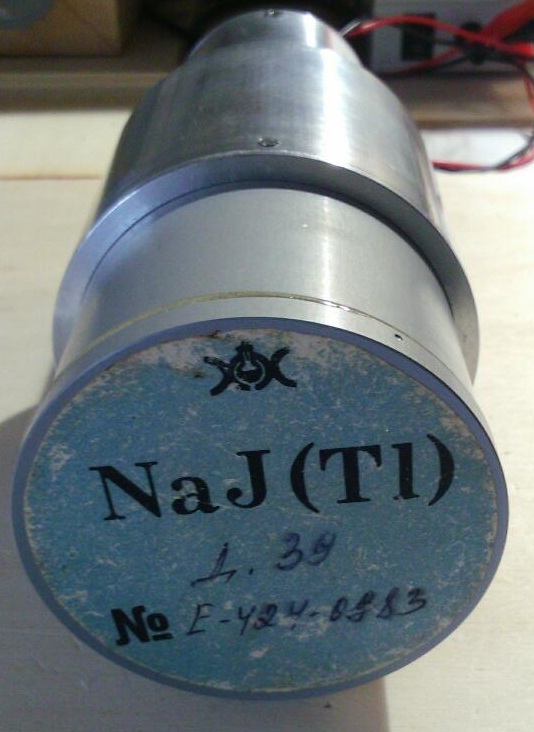 NaI(TI) is used traditionally in nuclear medicine, environmental measurements, geophysics, medium-energy physics, etc. 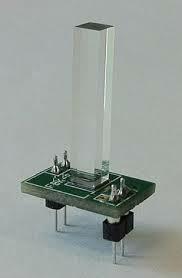 The fact of its great light output among scintillators, convenient emission range (in coincidence with maximum efficiency region of photomultiplier (PMT) with bialkali photocatodes), the possibility of large-size crystals production, and their low prices compared to other scintillation materials compensate to a great extent for the main Nal(TI) disadvantage. Which is namely the hygroscopicity, on account of which NaI(TI) can be used only in hermetically sealed assemblies. Varying of crystal growth conditions, dopant concentration, raw material quality, etc. 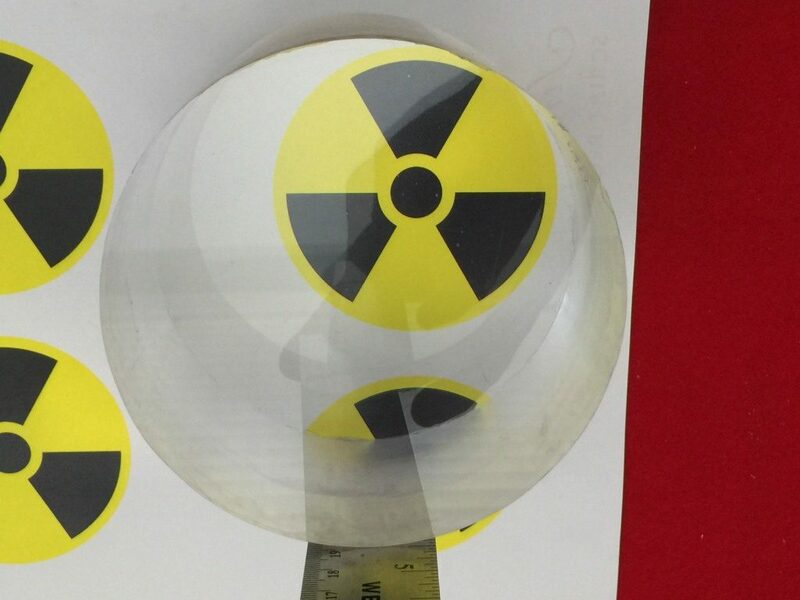 makes it possible to improve specific parameters, e.g., to enhance the radiation resistance, to increase the transparency, and to reduce the afterglow. For specific applications, low-background crystals can be grown. NaI(TI) crystals with increased dopant concentration are used to manufacture X-ray detectors of high spectrometric quality. NaI(TI) is produced in two forms: single crystals and polycrystals. The optical and scintillating characteristics of the material are the same in both states. In some cases of application, however, the use of the polycrystalline material allows coping with a number of additional problems. The decay time of Nal(TI) is 250 ns. 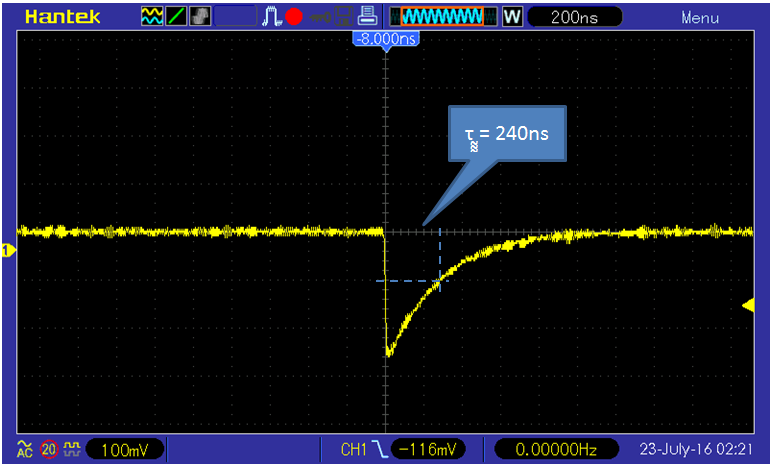 The chart below shows the pulse obtained from a NaI(Tl) crystal, it is evident the measured decay time close to the correct parameter. Cesium Iodide is a material with high γ-ray stopping power due to its relative high density and atomic number. Undoped CsI, being an intrinsic scintillator, has very different scintillation properties from the more widely used CsI(Tl) or CsI(Na) activated by Tl or Na respectively. Undoped CsI is mainly used in physics experiments because of its combination of fast timing and relatively high density. Its scintillation is heavily quenched at room temperature, and cooling improves the light output. CsI is slightly hygroscopic. Contact with water and high humidity should be avoided. Undoped CsI, also called CsI(pure) has an emission maximum at 315 nm with an intensity 1/10 that of the doped CsI crystals. CsI has a short decay time of 16 ns which represents 70 to 80% of the light output in good quality large pieces. 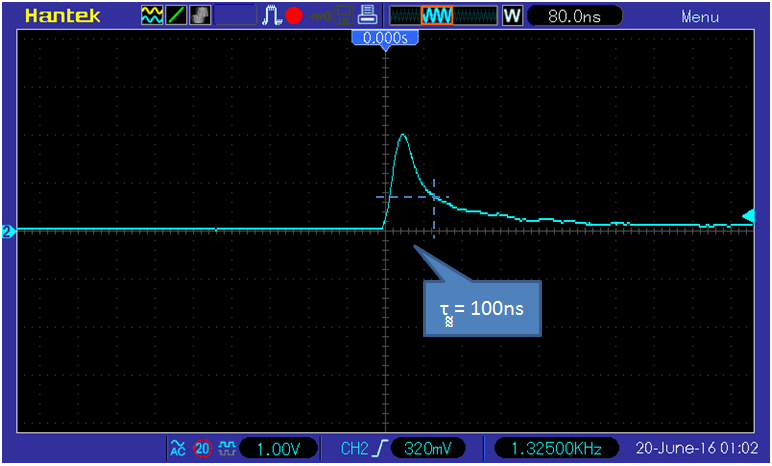 The chart below shows the pulses obtained from a CsI crystal, with a load of 1 kΩ. It is evident the low amplitude of the pulses. Bismuth Germanate (Bi4Ge3012 or BGO) is one of the most widely used scintillation materials of the oxide type. It has high atomic number and density values. Detectors based on BGO have volume 10 – 4 times and mass 5 – 7 times less than those with Alkali Halide scintillators. BGO is mechanically strong enough, rugged, non-hygroscopic, and has no cleavage. 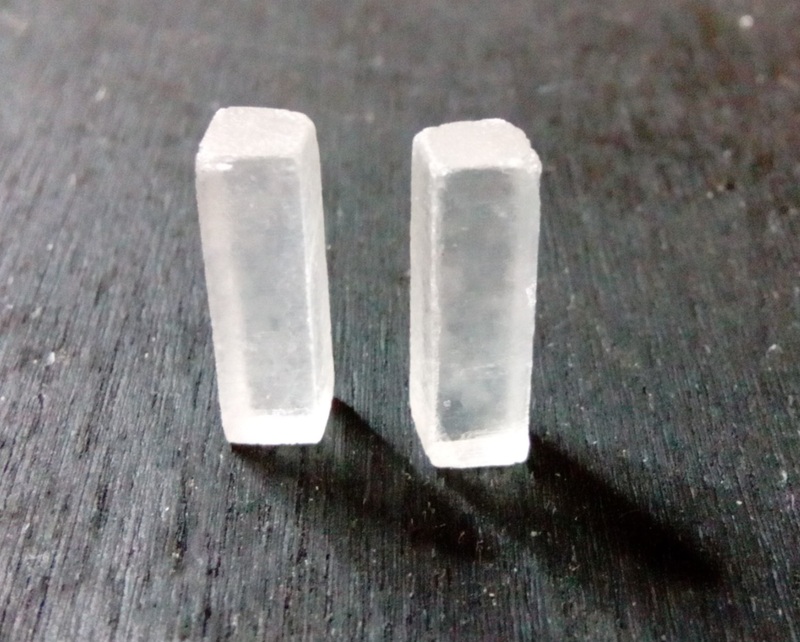 BGO has an extreme high density of 7.13 g /cm3 and has a high Z value which makes these crystals very suitable for the detection of natural radioactivity (U, Th, K), for high energy physics applications (high photofraction) or in compact Compton suppression spectrometers. BGO detectors are characterized by high energy resolution in the energy range 5 – 20 MeV, a relatively short decay time; its parameters remain stable up to the doses of 5 x 104 Gy; large-size single crystals are possible to obtain. Due to these features, BGO crystals are used in high-energy physics (scintillators for electromagnetic calorimeters and detecting assemblies of accelerators), spectrometry and radiometry of gamma-radiation, positron tomography. 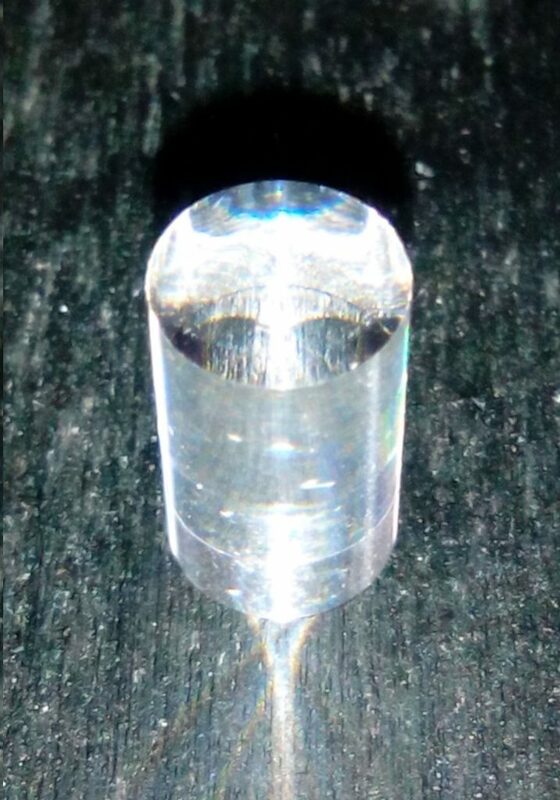 LYSO (Lu 1.8Y.2SiO5:Ce) is a Cerium doped Lutetium based scintillation crystal that offers high density and short decay time. 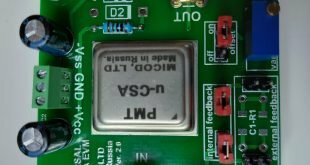 It is ideal for applications that require higher throughput, better timing and energy resolution, including time-of-flight PET. PET applications have traditionally used arrays of BGO. LYSO crystal competes directly on density and surpasses BGO on energy resolution, timing and throughput. LYSO scintillator has shown up to three to four times the light emission of BGO. The 1/e decay time is 45 ns for standard LYSO and 35ns for enhanced LYSO crystal, which is much shorter than the decay time of BGO. It is a single exponential with no long components present. This allows for higher rates, greater throughput and better timing. The emission of scintillation light matches well with the sensitivity spectrum of most PMTs and SiPMs, The chart below shows the emission spectrum of a LYSO crystal excited with a UV lamp. The LYSO material is a Lutetium-based scintillator which contains a radioactive isotope 176Lu, a naturally occurring beta emitter. 176Lu beta decays to 176Hf 99.66% of the time to the 597 keV excited state. This state decays with a 3 gamma ray cascade of 307, 202 and 88 keV. This lead to a not negligible intrinsic activity which is the main disadvantage of this material. The term “plastic scintillator” typically refers to a scintillating material in which the primary fluorescent emitter, called a fluor, is suspended in the base, a solid polymer matrix. While this combination is typically accomplished through the dissolution of the fluor prior to bulk polymerization, the fluor is sometimes associated with the polymer directly, either covalently or through coordination, as is the case with many Li6 plastic scintillators. Polyethylene naphthalate has been found to exhibit scintillation by itself without any additives and is expected to replace existing plastic scintillators due to higher performance and lower price. 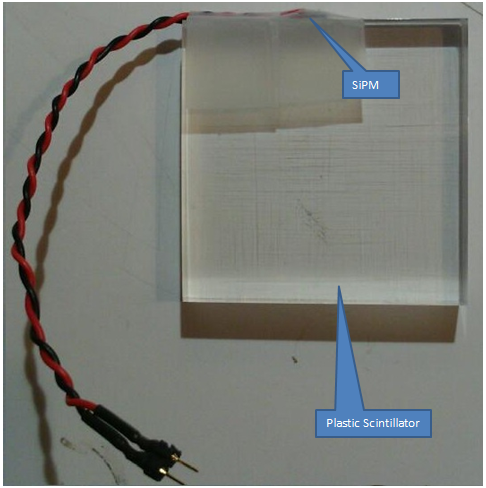 The advantages of plastic scintillators include fairly high light output and a relatively quick signal, with a decay time of 2–4 nanoseconds, but perhaps the biggest advantage of plastic scintillators is their ability to be shaped, through the use of molds or other means, into almost any desired form with what is often a high degree of durability. In the image above there is a squared plastic scintillator used in the cosmic coincidence detector, while in the image below there is a cylinder plastic scintillator we have used in the cosmic muons detector. The decay time of ZnS(Ag) is 100 ns. The chart below shows the pulse obtained from a ZnS(Ag) screen, it is evident the measured decay time close to the correct parameter, even if there is a “long tail”.